Imagine an ancient world torn apart by primal powers. A place where magic runs through all living things and erupts from the minds of powerful magi, where humans, elves, dwarves and orcs walk the same earth, where ancient gods fight side-by-side with mortals in an endless battle between order and chaos. Adventure is everywhere. This is the world of Heroes Against Darkness. Heroes Against Darkness is a free, fast, flexible, and fully-featured fantasy d20 RPG system. The game is quick to learn and play, while offering progressively greater options and flexibility as players develop their characters and explore the breadth and depth of the system. Please include an extra copy of the rules minus the parchment color in your next edition. I'd like to print this at home without using up unnecessary toner. I'm very excited to try this rule set! So I don't know what happened here, but this product lost a bunch of files, including the printer-friendly version. So I have re-added them! I have to know: why is the class called Hospiter rather than Hospitalier, which seems to be what you are aiming for? Hahaha. Such a good question. I figured that Hospitalier was hard to say, so I shortened to Hospiter. So, I notice the little note about "Hybrid classes" in the class section. But there aren't any guidelines for them at all? I mean, it says they get powers more slowly but there are no rules for it at all? Are you just supposed to homebrew it? In the PDF verison , the bookmarks don't seem to work. 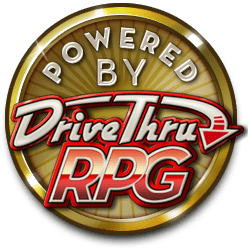 Hi Brian, I just checked the files and 'purchased' and downloaded the PDF from DriveThruRPG and the bookmarks are working fine for me in Foxit Reader. Any more information about the problem? This title was added to our catalog on October 31, 2012.